Glossary of Optics Terms - a more in-depth explanation of many of these terms can be found on our How to Buy Binoculars page. Anti-Reflective Coating - A coating for lenses to improve the color and contrast of the viewed image and enhance the image's brightness. 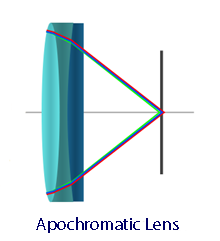 Apochromatic (APO) or Apochromatic Lens - A lens system which corrects for spherical aberration at two wavelengths (colors) and for chromatic aberration at three wavelengths so that it has much better correction than the much more common (and less costly) achromat lenses. 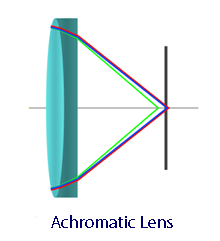 Achromat lenses only correct for spherical aberration at one wavelength and two wavelengths for chromatic aberration. Apo binoculars provide a significantly more crisp image by largely eliminating the softness of images and color fringes at high-contrast edges. While this is of interest to many, it is perhaps of special interest to those using optics for astronomy and photography and seeking to achieve the sharpest imagery possible. Apparent Field of View - That part of a 360° circle that appears to be in view when looking through an optical instrument. The apparent field of view is calculated by multiplying the real angle of view by the magnification power. Generally, binoculars with an apparent field of view greater than 60° are considered to provide "wide-angle" viewing. Argon-purged - Argon is similar to nitrogen and is sometimes used instead of nitrogen to replace/remove the gaseous water molecules in the air inside binoculars. This is routinely done when sealing binoculars to make them both waterproof and internally fog-proof. Argon is marketed as providing an advantage over nitrogen because its molecules are larger than nitrogen's — with the thinking that the larger molecules are less likely to escape from within the instrument than those that are smaller. There are advantages and disadvantages to both nitrogen and argon — one is not clearly better than the other. Armor Coated - This typically refers to a thin layer of rubber applied to external surface of binoculars to provide a measure of protection against harm if bumped, dropped, or subject to extended periods of vibration. This rubber coating generally deteriorates over time. A rubber coating is a disadvantage if/when an instrument needs to be serviced or repaired. Aspherical Eyepiece Lenses - These are non-spherically shaped (not "round") lenses which help to minimize viewing aberrations and maximize the flatness of field for a more uniform focus of light rays. Aspheric lenses are more difficult to make if not simply molded in a form (the molded ones are generally optically inferior to ground lenses), but provide superior optical results. Due to the uniform curvature, spherical lenses are easier and cheaper to produce than aspherical ones. Auto Focus - This might well be called "permanent focus." A binocular with auto focus is permanently focused for use on objects or activity from medium distances to infinity. BaK-4 Prisms - These are prisms made of barium crown glass which is a high density glass. BaK-4 prisms eliminate internal light diffusion or scattering and provide significantly sharper images than BK-7 glass. The main optical difference between BaK-4 and BK-7 glass is its density or essentially its "refractive index." Although BaK-4 and BK-7 prisms are the most commonly used, there are other glass types used. Since the density of the prism is the important element, unless the density of the other glass types is equal to or greater than that of the BaK-4 they are not as good. Quality binoculars typically use BaK-4 or better prisms. Barreling - The distortion of images in which straight lines appear in the binocular as though they were curved. When lines appear to be curved outward, or bulged, it's referred to as barrel distortion. When the lines appear curved inward, it's called pincushion distortion. BK-7 Prisms - These prisms are made of boro-silicate glass which is a lower density glass (optically inferior) than BaK-4 and loses more light. One way of determining if a binocular's prisms are BK-7 or not is to hold them away from the eyes and look at the light coming through them. BK-7 prisms will usually show shading which produces four sides and appearing like a square if viewed with the top and bottom sides horizontal or a diamond if viewed with all sides diagonal while the beam of light coming from higher grade prisms will be more nearly circular. Because BK-7 glass is less dense and consequently cheaper, BK-7 prisms are usually found in inexpensive binoculars. Images viewed through BK-7 prisms are less distinct, provide less contrast, and have poorer color fidelity. Central Focus Control - This is a knob that provides for the adjustment of both barrels of a binocular at the same time. Binoculars either have a central focus control or the barrels are individually focused. Chromatic Aberration - Chromatic aberration is the inability to bring different wavelengths of light (colors) into focus, usually producing a relatively faint halo of color around an object. It may depend on the brightness of the image and may not treat all images alike as to the color of the halo. Also, the halos may be one color on one side and another color on the opposite side. You can test for chromatic aberration by looking at a high contrast item such as an overhead wire against the bright sky. 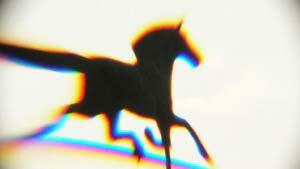 Chromatic aberration will often show up as green, yellow, or violet fringes of light along the edges of the object. Close Focus Distance - The closest distance to an object you can be and view it clearly through a binocular. Coated Optics - Are those which have had an anti-reflective coating or film applied to at least one surface. Typically, this will be the objective or eyepiece lens - the ones you can easily see. Please see Lens Coatings on the How to Buy Binoculars page. Collimation - Collimation refers to the optical and mechanical alignment of the binoculars. If they're not collimated, you'll see a blurred or "double" image which will lead to eye strain and potential headaches. Collimating instruments takes manufacturing time and expense and increases their retail price. Inexpensive binoculars often seem to be poorly collimated as received from the factory. A strong bump, dropping the binocular, or prolonged, strong vibration can sometimes knock an instrument out of collimation. Adjusting the collimation should be done by the manufacturer or a reputable binocular repair service. Compact Binocular - Any binocular with an objective lens (the lens at the front of the binocular) diameter of 30 millimeters or less is considered a compact binocular. "Pocket" binoculars are usually on the smaller and lighter end of the compact binocular range. Depth of Field - The degree to which prisms flatten out or clearly separate elements of the viewed image. The offset design of Porro prisms provides a greater depth of field and a more three-dimensional image that is perceived as more "life-like." Depth of View - Depth of view relates to how much you can see without needing to re-focus your optics. If you focus for a sharply defined specific image and can readily observe and identify images about eight feet closer than and beyond that point, you would have a reasonable depth of view. A significant depth of view is of benefit, for example, for a bird watcher when conducting an-all day bird count or observing a grouping of water birds. Constant re-focusing would be necessary with a shallow field of view and both tedious and tiring. Among numerous other examples, a farmer/rancher, law enforcement officer, etc, surveilling a scene would need good depth of field to observe activity taking place within a range of distance. Diopter Control - Since a person's vision is usually different for each eye, the diopter control is a separate focusing control associated with one eyepiece so that the binocular can be adjusted the difference between eyes. Please see our page on How to Focus a Binocular. Distortion - Barreling and pincushion effects are distortions of images in which straight lines appear in the binocular as though they were curved. When lines appear to be curved outward, it's referred to as barrel distortion. When the lines appear curved inward, it's called pincushion distortion. A complete absence of barreling and/or pin-cushioning can produce a "roller ball" in which it appears that you're looking at things through a wide-angle lens and the "ball" in the view seems to roll as you pan across a scene. Many feel a very minor amount of barreling and/or pin-cushioning an acceptable trade off for avoiding the roller ball effect. Eco-Glass - Optical glass manufactured using recently developed techniques to avoid the use of lead or arsenic. Since lead and arsenic produce a very high grade of optical glass, some have preferred it over that made without. ED or Extra-low Dispersion Glass - Objective lenses made from extra-low dispersion glass are able to focus the light waves of the various colors on the same plane (such as your eye) more effectively than other glasses. Because of this, ED glass reduces chromatic aberrations and the associated blurring of image details. (Although the means to achieve the results differ, aspheric lenses are used to similarly focus light on the same plane.) This enhances the resolution, color, contrast, and particularly the brightness of viewed images and may be particularly easy to observe in low light conditions. The term "high density (HD) glass" is also used to describe this type of glass. Exit Pupil- The exit pupil is the beam of light coming from the eyepiece that carries the magnified image to the eye. It is measured in millimeters and a larger exit pupil means a brighter image. Eyecup - Eyecups are usually provided at the eyepieces are commonly either of flexible rubber and can be folded down or are of a harder material which can be raised or lowered by twisting. The eyecup holds the eyepiece a certain distance from the eye in order to optimize the viewing experience for those who do not wear eyeglasses. The eyecup is folded or twisted down by eyeglass wearers to allow the eyeglasses to fit up against the eyepiece - with the eyeglasses providing the distance from the binocular eyepiece necessary for optimal viewing. The space or distance from the eyepiece for optimal viewing is called the "eye relief." Eye Relief - This is the distance, in millimeters, away from the eye that the binoculars can be held and still allow the user to see the entire field of view image. Eyeglass wearers will want 16 to 19 mm of eye relief to allow for the eyeglasses to fit between the eye and the binocular eyepiece. If you wear glasses and don't have astigmatism it's better to take your glasses off when using binoculars. Eyepiece lens - This is the last lens through which light passes before reaching the eye. Typically, this lens should have an anti-reflective coating applied to it as with "fully multi-coated" optics. The most common type of binocular eyepiece is the Kellner eyepiece, although the Efrle eyepiece is usually used to obtain a wider field of view. As might be expected, the Erfle eyepiece is of a more complex design and will cost a bit more. Koenig eyepieces are sometimes used in high quality binoculars. The type of eyepiece is not as important, however, as the quality of the optical glass used, the care taken in manufacturing it, and the type and quality of coatings applied to it. Field of View - This is the lateral measurement of the area that can be viewed at 1,000 yards or 1,000 meters. Flatness of Field - This describes the edge-to-edge sharpness of the viewed image. When flatness of field is lacking, the image is degraded and it is difficult or impossible to focus so that both the center and edges of the image can be clearly seen at the same time. Fog-proof - An optical instrument is said to be fog-proof when it has had the air purged by filling with an inert gas, such as nitrogen or argon, and sealed with O-rings to prevent moisture from entering, thus preventing internal fogging. This does not mean that fog will not form on the exterior surfaces of the eyepiece and objective lenses when taken from a cool area, such as an air conditioned room, into a warm, humid area. Fog-proof and waterproof binoculars have fewer problems with fungi growing inside and eating the coatings of their prisms and lenses. Fully Coated - Means that all air-to-glass surfaces have at least one coating or film to improve light transmission and reduce glare / reflected light. Please see Lens Coatings on the How to Buy Binoculars page. Fully Multi-coated - This means that all air-to-glass surfaces have multiple coats or films to maximize light transmission and minimize reflection and glare. Please see Lens Coatings on the How to Buy Binoculars page. Multi-coating was introduced to the market in a big way during the 1980s. Galileo Binoculars - These binoculars receive their name from the concave lens system which follows that used in telescopes made by Galileo in the 1600s. Because of the concave lenses, prisms are not necessary for image correction. These types of binoculars are often called "opera glasses" and are not generally used for looking at distant objects or activities. Giant Binoculars - Having an objective lens of 60 mm or greater qualifies a binocular as a "giant binocular." Typically giant binoculars are used for astronomy, obervation of wildlife, surveillance, search and rescue, and such from greater distances. HD or High Density Glass - Objective lenses made from high density glass are able to focus the light waves of the various colors on the same plane (such as your eye) more effectively than other glasses. Because of this, HD glass reduces chromatic aberrations and the associated blurring of details. (Although the means to achieve the results differ, aspheric lenses are used to similarly focus light on the same plane.) This enhances the resolution, color, contrast, and particularly the brightness of viewed images and may be particularly easy to observe in low light conditions. The term "extra-low dispersion (ED) glass" is also used to describe this type of glass. Image Blackout - This is caused by lower quality BK-7 prisms which nearly always allow excessive scattering of light and usually produce a shadowing / clouding effect at the eyepiece which appears as though the user's view is restricted by looking through a diamond-shaped lens. Also called "vignetting." Image Stabilized - Binoculars for which the viewed image is electronically held steady to compensate for vibration or unsteadiness in the user or user's platform. These are ideal for use in a moving vehicle, on a boat, or in other situations where excessive shake or vibration is a concern. In situations where age or health condition has resulted in unsteady hands, users have expressed appreciation for image stabilized binoculars. Individual Focus Eyepiece (IF) - These eyepieces focus independently of each other and, once focused, the binocular can easily be used for clear viewing at most medium and long distances. Individual focus binoculars are easier to waterproof than central focus binoculars because they are two self-contained, sealed tubes without the additional complexity of a central focus device connecting them. IF binoculars are commonly found in marine and astronomy models. Internal Blackening - This is the blackening of all metal surfaces inside the binocular barrels to reduce reflected light. To test a binocular for internal blackening, look into the objective lens at a 45° angle. Internal metal surfaces should not be visible. Inexpensive binoculars are often able to be produced cheaply by not including manufacturing processes such as this. Interpupillary Distance (IPD) - This is the distance between the eyepiece centers of binoculars and is adjustable to adapt to the varying distances between people's eyes. Ideally and in most cases, the pupil of the user's eye is aligned with the binocular's exit pupil. Lens Coatings - These are films or coatings applied to lenses to improve the viewed image's color, contrast, brightness, and clarity. The quality, type, and method of coatings applied to lenses are critical elements in the quality of the optical instrument and viewed image. When applied correctly a very thin coating of magnesium fluoride, for example, can reduce reflected light by up to 2% per glass surface. Manufacturers work to establish reputations for quality in this area since coatings must be absolutely uniform in density and thickness or else they will produce unpredictable reflections and other problems. The visible color of a coating is not a reliable indicator of its nature or quality. Binoculars with UV coatings do reject harmful UV light and perform well at high altitudes, but don't transmit as much light as multi-coatings. 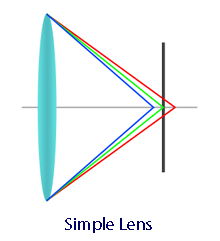 Lens Distortion - Results from poorly ground and polished lenses which provide an uneven magnification of the viewed image. Light Transmission - All optical glass both absorbs and reflects light, both of which result in light loss. The extent of this loss is considered a measure of the quality of an optical instrument. A binocular with lower quality prism glass and no lens coatings may have a light transmission as low as 50% and one with quality prisms and expertly applied, quality, full multi-coating as high as 95% or slightly more. Some absorption is expected and cannot presently be corrected for. A difference in light transmission of a couple of percentage points between binoculars is unlikely to be noticed when actually using them. Magnification Power - This is the first number in a binocular's designation or configuration (an 8X42 binocular will magnify by 8 times). 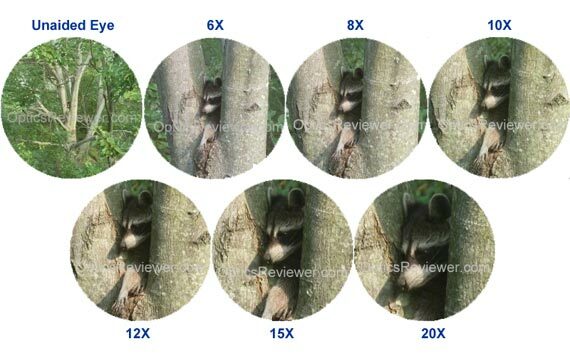 An 8X binocular would present the image to the user 8 times larger than it would be to the unaided eye. Monocular - Half of a binocular, a monocular is often favored by backpackers and experienced travelers. Monoculars are available in both roof and Porro prism designs. Although it used to be quite difficult to find waterproof, fully multi-coated monoculars with BaK-4 prisms, there are several companies providing them now. Multi-Coated - Means that one or more air-to-glass surfaces have a coat or film applied to improve light transmission and reduce reflected light. Some surfaces may have a single coat or not be coated at all. Please see Lens Coatings on the How to Buy Binoculars page. Nitrogen-filled - Rendering a binocular waterproof and fog-proof requires removing the air, containing gaseous water molecules, and replacing it with an inert gas. After removing the air and replacing it, the binocular is securely sealed with O-rings. Nitrogen is the most commonly used inert gas, although argon is seeing increased use (see "argon-purged" for reasons why). Nitrogen is sometimes considered to have an advantage over argon because it's less likely to migrate through semi-permeable barriers. There are advantages and disadvantages to both nitrogen and argon — one is not clearly better than the other. Waterproof binoculars typically have fewer problems with fungi growing inside them. Objective Lens - This is the lens at the front of the binocular. The objective lens is a major factor in determining how much light enters the binocular and its size is measured in millimeters. The size of the objective lens is the second figure given in a binocular's designation / configuration. For an 8X42 binocular, the objective lenses are 42 mm in diameter. Contrary to a common misperception, the size of the objective lens is not related to a binocular's field of view. P-coating / Phase Correction Coating - This is a coating applied to the optics of roof prism binoculars. It corrects the phase shift typically occurring within the prism, resulting in ultra-sharp images for the viewer and improved color fidelity. Phase correction coating was introduced/popularized during the 1990s for the most part. Most roof prism design binoculars today have phase correction coating — but not all. Due to the optically inferior nature of roof prism binoculars without phase correction coating, OpticsReviewer.com does not feel that consumers are well-served by them and does not recommend them. Pincushioning - Pincushioning is the distortion of images in which straight lines appear to curve inward. When lines appear to be curved outward, or bulged, it's referred to as barrel distortion. Pocket Binoculars - These are typically a small roof prism binocular which will fit comfortably into a shirt pocket. Because of the limitation on size, a 26 or 28 mm objective lens is typically the maximum. Some compact binoculars, particularly the reverse Porro prism designs, may not fit into a shirt pocket. All pocket binoculars are compacts, but not all compacts are pocket binoculars. Porro Prism - Binoculars using the Porro prism design have an offset (please see illustration in How to Buy Binoculars). The bending of the incoming image in the Porro design provides a lifelike three-dimensional image. The design, however, requires the image to take a more complex path and results in a somewhat larger, bulkier instrument than the roof prism design. Prism - There are two prism designs - the roof prism and the Porro prism. If it were not for prisms, the images you would view with binoculars would be both reversed/backwards and inverted/upsidedown. Refractive Index - This is an index measuring the speed of light in a substance. Because light travels more quickly through glass of a greater density, when the index is applied to glass prisms, it essentially measures the density of the glass. Prism glass of a higher refractive index figure will provide a superior image to that of a lower index figure. Relative Brightness - The usefulness of an optical instrument lies in its ability to both gather and transmit light. The Relative Brightness and Twilight Factor calculations were originally an effort to provide a measurement of a binocular's efficiency in this area. Because of improvements in prisms, optical coatings, and the glass used in objective lenses, however, these calculations are no longer as meaningful as they once were. Your OpticsReviewer has provided the relative brightness index in a number of charts for comparison purposes within the same binocular manufacturer and model. Comparing the relative brightness between different models or manufacturers does not provide useful information since the coatings, quality of glass, etc, are likely to be different. Resolution - Resolution is the ability of an optical instrument to distinguish fine details. Because larger objective lenses have a correspondingly larger center area of sharp resolution, a larger objective lens has historically been associated with higher resolution instruments. Reticle - Reticles are scales, or "crosshairs," (measuring devices) placed in an optical system. A reticle in a binocular or monocular is a tool for estimating the distance, or "range," from the instrument to the viewed object. Rolling Ball Effect - Also known as the Globe Effect or Spinning Globe Effect, this is an optical phenomenon which especially happens in binoculars and telescopes which are designed to be free of distortion. When looking from side to side with such instruments, the image appears to roll over a convexly curved surface. In some cases it is possible to experience nausea related to this optical experience. Most binocular manufacturers intentionally design their optics to include a small amount of pincushion distortion to prevent the rolling ball effect. Roof Prism - The roof prism design provides for a slimmer, lighter binocular than the Porro prism design. It passes the image through a straight barrel to the user's eye. Roof prisms have historically been more expensive because the prisms' small size required special grinding and polishing, although the price difference has been significantly reduced in recent years. SK-15 Prisms - Prisms of very high density SK15 glass that enable minimization of undesirable internal reflections and thus provide a crystal clear image with the best contrast. SK-15 prisms are available in some binoculars and provide a higher refractive index (a measure of the density of the glass) as follows: N-BK7 - 1.51680, N-BAK4 - 1.56883, N-SK15 - 1.62296. Twilight Factor - The usefulness of an optical instrument lies in its ability to both gather and transmit light. The Twilight Factor and Relative Brightness calculations were originally an effort to provide a measurement of a binocular's efficiency in this area. Because of improvements in prisms, optical coatings, and the quality of glass used in objective lenses, however, these calculations are no longer meaningful. Water Resistant - Binoculars designated as water resistant can tolerate very brief exposures to very light rain, for example. They are not expected to survive immersion without significant damage. Unless your binoculars will not be used outside at all, waterproof binoculars are a wise investment. Vignetting - This is caused by lower quality BK-7 prisms which nearly always allow excessive scattering of light and usually produce a shadowing / clouding effect at the eyepiece which appears as though the user's view is restricted by looking through a diamond-shaped lens. Also called "image blackout." Wide-angle Binocular - This is any binocular with an apparent angle of view exceeding 60°. Wide-angle binoculars usually provide shorter eye relief, which may cause some eyeglass wearers to lose interest in using a wide-angle binocular. Zoom Binoculars - These are binoculars which provide a range of magnifications in one package. In general, zoom binoculars are not as good as a fixed setting binocular. They usually must be re-focused after changing the magnification. They're heavier than a fixed setting binocular due to the zoom mechanism, more expensive than a fixed setting instrument, and their design requires optical compromises.